^ Anderson, Mike (March 5, 2019). 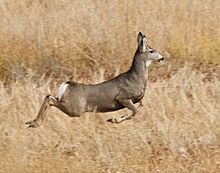 "DWR Biologists Use Helicopter Rides, Ultrasound, To Check on Deer Pregnancies". KSL. Bonneville International. Retrieved March 13, 2019. ^ a b c Mejía Salazar, María Fernanda; Waldner, Cheryl; Stookey, Joseph; Bollinger, Trent K. (2016-03-23). "Infectious Disease and Grouping Patterns in Mule Deer". PLOS ONE. 11 (3): e0150830. doi:10.1371/journal.pone.0150830. ISSN 1932-6203. PMC 4805189. PMID 27007808. ^ Kucera, Thomas E. (1978-08-21). 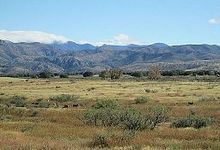 "Social Behavior and Breeding System of the Desert Mule Deer". Journal of Mammalogy. 59 (3): 463–476. doi:10.2307/1380224. ISSN 0022-2372. Wikimedia Commons has media related to Odocoileus hemionus.